The “ladies” break with tradition to form a hockey team that eventually fights for the national cup. It starts before we’re all seated. A caretaker in over-boots and a warm sweater watering the ice on the rink before us. 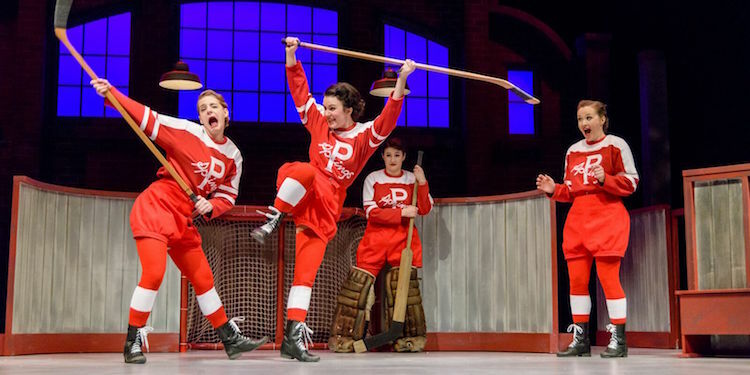 In reality, it is Andrew Wheeler’s start to Tracey Power’s play, “Glory,” about a young women’s hockey team in the 1930s. Wheeler’s character Herb Fach, the reluctant coach of the team, is an absolute stand-out. He plays the increasingly lovable curmudgeon from start to finish with utter believability. The rest of the cast is in the same league. Each a stellar actor, the women are a team, in every sense of the word. As an extra bit of entertainment and to get us in the mood, the usual announcements came across the speakers as an old radio announcer told us to turn off our phones and the regular business of settling in to enjoy a play. It was crisp and clear. At times, the radio announcer’s words later in the play, weren’t always quite as clear. And, another time, the background audio drowned out what one of the women was saying. Other than that, the sound was fairly easy to discern though some older people who had been sitting in one of the last rows came forward after the break saying that they always found the sound at the back of theatre hard to hear. Power was more than the writer on this work; she also choreographed the women’s skating which at times was clearly gliding across the ice. For the games, it became a group dance in swing time with the hockey sticks adding percussive notes along the way. After the break, it was no longer the beginning of the Dirty Thirties but the 1938-39 season. War loomed. The line, “Toronto always think they are better than they are,” got a knowing laugh even though, in this case, they were just discussing their women’s hockey team. The play ended with thunderous applause and a quick, spontaneous standing ovation. If you are looking for good theatre, Glory is a play to see. One of the characters dreams of trying out for the NHL. Interestingly enough, Danielle Dube, now a Richmond firefighter, was in the Gateway audience on opening night. In 2002, she was the third female goaltender to start in goal for a professional men's team. As a poignant note, the women on the team muse if there will ever be a professional women’s hockey league. When Power wrote the play, there was. It has now folded. Our Sentinel sports reporter came with me. Not a regular theatre-goer, he enjoyed the play. He says he’s glad he went. That seemed to be the general feeling of the audience at the reception afterwards. As we munched on tasty bites from the Sheraton Vancouver Airport Hotel and mocha cake from Anna’s Cake House, everyone I spoke with seemed glad that they too had seen the play. A note to the people of Richmond: in introducing the play, the representative of the two theatre companies producing this play—Western Canada Theatre and Alberta Theatre Projects—described the Gateway as a “jewel of a theatre.”Describing it as a play about the empowerment of women, “Glory,” after its run in Richmond, heads on to an 11-venue tour. Lest we think that this season that featured some highly-skilled female playwrights is an anomaly, Jovanni Sy also programmed the upcoming 2019-20 season where all the plays are written by women. If this past year’s programming is any indication of what is to come, our city owes a big thank you to Sy for his parting gift to our community. “Glory runs at Richmond’s Gateway Theatre through April 13 with a variety of special offerings. Check the websiteor call the box office at (604) 270-1812.